When a vehicle leaks, it can be traced back to the malfunctioning part. Perhaps the most difficult part of fixing a leak is learning where it comes from. If you use the following tips, you'll be able to locate the root of the problem. Check out the color of the fluid to find out where it comes from. A blue hue means that coolant is leaking. Dark burn marks indicate that battery acid is the culprit. Yellow marks can be attributed to power steering fluid. Clear markings may be due to water leakage. Determining the color is crucial to finding out why the leak is happening. 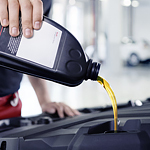 One of the most serious leaks concerns brake fluid. However, brake fluid leakage is not very common. Yet, when it does happen, you need to get it fixed right away. A lack of brake fluid means your brakes will malfunction. To locate a brake fluid leak, look for yellow-colored fluid that has a foul odor. Let Spokane Hyundai fix your vehicle's fluid leaks. Make an appointment at the service center soon.